Containing some pinups by George Pérez. 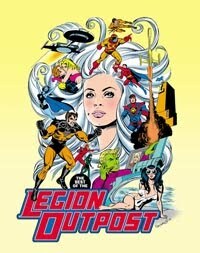 The Legion Outpost is one of the oldest and most well-respected of all the comics fanzines. In 2004, as a sister title to their Legion Companion volume, TwoMorrows released an anthology of the best articles from the legendary zine. What is presented has some good, some bad and some odd aspects to it. THE GOOD: Like all good fanzines, The Legion Outpost was driven in great part by passion and enthusiasm for the subject matter. Legion fans are justifiably famous for their love and encyclopedic knowledge of the longtime series. Thus we get articles about politics on the planet Bismoll (home of Matter-Eater Lad, don'tcha know?) or a look at the astrological signs of the heroes. While those articles are fun, only a few of them go a long way for the casual fan. The nicest feature of the book is the plethora of commissioned art. The book includes art by such luminaries as Curt Swan, Dave Cockrum, Walt Simonson, George Perez, Sergio Aragones and many more. It's a joy to see all this wonderful art, and it really enlivens the book. THE BAD: The low points of the book to me are some of the interviews. While some, like the interview with Jim Shooter, are very revealing, others are obscure and impossible to follow for the non-initiate. For instance, there's a nine-page interview with Roy Thomas. Thomas is a great and important figure in comics history, but he wrote maybe a half dozen Legion stories. What purpose is served by running a long interview with such an unimportant figure in Legion history? Flipping through The Best of the Legion Outpost, one can’t help but admire the wide-ranging artwork: from the silly Fred Hembeck images to bold George Perez character models, from unpublished Jimmy Janes covers to reprints of Curt Swan Adventure Comics covers from the 1960s. My favorite is a two-page 13 panel Keith Giffen Legion of Super-Heroes in-house promo from the 1982 DC Sampler that I haven’t seen in over twenty years. Each panel uses the title of another DC comic (Adventure, Action, Detective, Combat, Mystery in Space, Young Love, Plop) to emphasize the varying aspects of The Legion of Super-Heroes. Like last year’s The Legion Companion, The Best of the Legion Outpost is amazingly littered with both familiar Legion images and unseen commission work from private collections. Originally published in 1972 as the official newsletter of the Legion Fan Club, the Legion Outpost soon became the premier Legion of Super-Heroes fanzine of the 1970s, featuring contributions by fans, pros, and soon-to-be pros. Launched at a time when the future of the Legion of Super-Heroes was in doubt, the Legion Outpost was at the center of fan-based efforts to revive the title, and was largely responsible for its rescue from obscurity, leading to it becoming a runaway best-seller! This trade paperback collects the best material from the hard-to-find fanzine, including rare interviews and articles from creators such as Dave Cockrum, Cary Bates, and Jim Shooter, plus never-before-seen artwork by Cockrum, Mike Grell, Jimmy Janes and others! It also features a previously unpublished interview with Keith Giffen originally intended for the never-published Legion Outpost #11, plus other new material! And it sports a rarely-seen classic 1970s cover by Legion fan favorite artist Dave Cockrum! The 160 page (plus cover), square bound 8-1/2" x 11" trade paperback with full color covers and black-and-white interiors ships November 2004.